HIT Technologies Inc. (TSX VENTURE: HIT) (“HIT” or the “Company”) announced today that it is now taking pre-orders for its new Active Series cases ENDURO and SPLASH along with the company’s flagship product the HITCASE PRO for the new iPhone models Xs, Xs Max and XR.. HIT Technologies Inc. designs, develops, manufactures and distributes the world’s most advanced protective products for iPhone. SPLASH is a thin and light waterproof, drop and dust-proof protective case and is the second product alongside ENDURO in the recently launched HITCASE Active Series. MIL-SPEC shock rating to 6ft/2m and IP68 waterproof rated to 10ft/3m, lightweight, slim, with a soft-grip exterior and lightning fast installation with its two-piece design. It’s the case you wish you always had at a very approachable price. The Action REDi red button is a signature design feature that prompts the user to capture photo and video adventures with ease. In addition, you can turn your iPhone into a better camera: easily attach any HITCASE TrueLUX(R) magnetic waterproof interchangeable lenses to the SPLASH for more creative shots. SPLASH for the iPhone Xs, Xs Max and XR retails at $69.99 USD. ENDURO offers serious smartphone protection. Built to withstand hard-hitting drops and daily wear, this lightweight (44 grams) and slim, soft grip exterior case offers MIL-SPEC drop-proof and shatter-proof protection to 6ft/2m along with dirt, dust, sand and liquid-proof port coverage with no compromise in audio quality. The Action REDi red button is a signature design feature that prompts the user to capture photo and video adventures with ease. A 2mm raised lip around the phone and camera area provides ultimate screen protection for your iPhone. ENDURO for the iPhone X and XS retails at $39.99 USD. Ready for adventure? The HITCASE PRO offers extreme waterproof and shockproof protection for the ultimate iPhone case protection. Designed to withstand drops up to 16ft/5m and water depths up to 16ft/5m, the machined, anodized aluminum frame combines with our patent-pending ShockSeal technology, custom waterproof seals, and the highest quality polycarbonate to deliver ultimate protection for your iPhone. Mount it anywhere with the PRO railside mount system compatible with all 8 HITCASE mounts and GoPro mounts. Take stunning photos and videos with TrueLUX lens series from HITCASE. Now you can fearlessly capture and share your adventures with the world and have the freedom to take your iPhone anywhere – anytime. 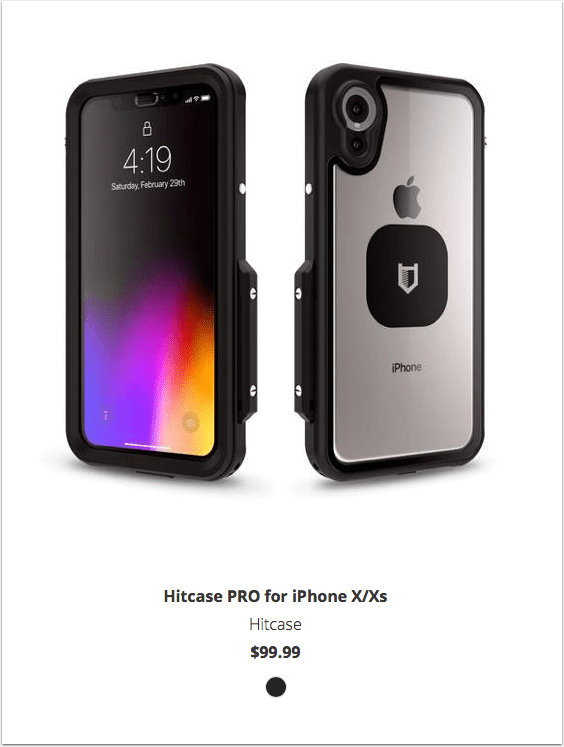 HITCASE PRO for the iPhone Xs, Xs Max and XR is offered at $99.99 USD.